What did you do on your summer vacation? Izzy visited her grandmother in Italy and what an adventure she had. 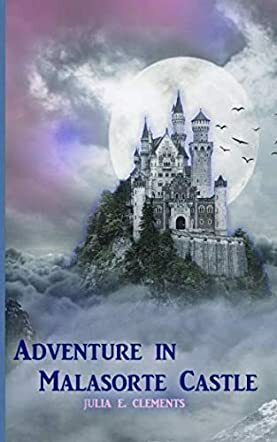 Adventure in Malasorte Castle by Julia E. Clements shares the escapades of Izzy and her new friends as they learn of Izzy’s grandmother’s stories of evil spirits and haunted castles. Izzy and her friends decide to spend the night in the local supposedly haunted castle to prove it really isn’t haunted. Izzy takes her grandmother’s spell book just in case they need to cast out any evil demons. Deciphering her grandmother’s spell book and putting the spell into action help the group become friends forever. Adventure in Malasorte Castle is a fun read and will keep the young reader turning the pages. The prologue set the mood of the book and provided a great hook. The theme of making friends is one that readers this age will connect with. I also loved the building of relationships between a grandmother and her grandchild. With a touch of demons and magic spells, Julia E. Clements stirs up a story that the young reader will enjoy. Izzy’s parents are going through a hard time and she worries about whether they will divorce. This issue is one that many young readers face today and the hope provided for them in the story - that things will be okay in the end - is a great bond for them. I recommend Adventure in Malasorte Castle for middle grade readers and, as an adult, even I enjoyed it!